Baba Beach Club in Phuket’s most northern point takes a musically unique approach to a good time. – Hello Asia! Baba Beach Club is serving up Ibiza-style, beach-themed vibes in a lush tropical environment. 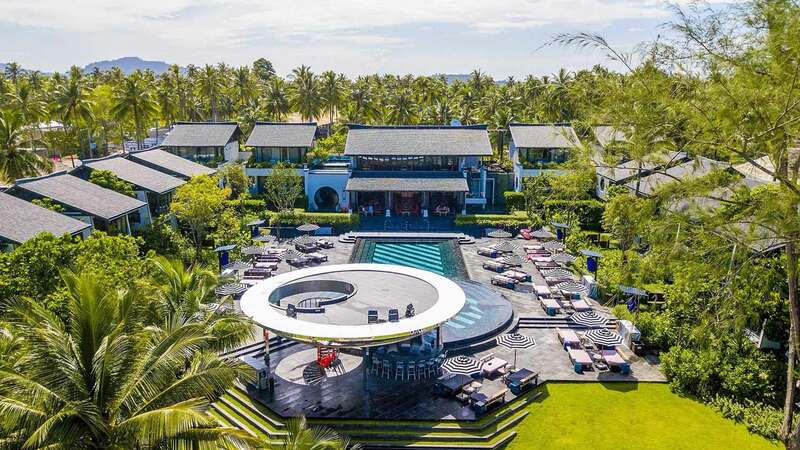 The resort has been fit out with Asia’s most powerful Funktion-One Sound System while private rooms and villas have been outfitted by either a Bose or Marshall Audio sound system, making it the obvious choice for the discerning music traveller. Baba Beach Club has played host to techno and tech house artists such as Nicole Moudaber, Maxxi Soundsystem and Shaded and Yoko, as well as collectives such as Colours of Love, Neverest and Die Empathie while sister hotel ‘Sri panwa’ has seen performances by the likes of Avicii, Rita Ora, Sasha, Skrillex and Snoop Dogg. Located on the complete opposite end to well-known tourist red light district, Patong, Baba Beach Club is situated 20 minutes north of Phuket International Airport on the Natai Beachfront, an unspoiled area with amazing views of the Andaman Sea. Fusing the perfect balance of design, architecture, service, good music and good vibe, owner and managing director Vorasit ‘Wan’ Issara has created an opulent, open beach club experience for the discerning music lover. We sat down with Vorasit ‘Wan’ Issara to talk about his inspiration for the self described ‘Music Lovers Hotel’ and the importance of music in his concepts. What exactly is a luxury lifestyle hotel for music lovers? How does it differ from a traditional luxury hotel experience? It is a combination of the best in hospitality and carefully curated music. Traditional hotels often associate luxury with formality but you wanted to create something that was both luxurious and fun. How did you go about creating this and why was it important for you to challenge this norm? It was a natural step from Sri panwa into Baba Beach Club. We developed the style of approachable top end luxury at Sri panwa and music was a big part of the hotel’s ambiance. Baba Beach Club simply aims to go deeper into the music and entertainment aspect. Many people travel for more than just a nice hotel these days, they want all of these experiences. We want to be able to deliver the best in all of the experiences for our guests, from food to music. Who has been the most memorable act at Baba Beach Club so far? So far it would have to be Nicole Moudeber. It was a proud moment for us and a great experience to see her play. Baba Beach Club boasts what has been dubbed ‘the best sound system in Asia’ and each room in the resort is fitted with either a Bose or Marshall audio sound system with carefully curated playlists loaded into the iPads and iPods in every room. Talk us through a day in the life of a playlist at Baba Beach Club. We do have special playlists for almost any occasions. So when you wake up we have “Morning Lounge” playlist which include very chill music with morning atmosphere it helps you wake up and smoothly transit to breakfast area. Each sessions in this playlist are around 3 hours long and gradually ease into your pool party mood. In the end you ready to attend a day time pool party. For this period we use “House sessions” – mix of specially crafted pre-made mixes by in-house and guest DJ’s, “Disco House / Disco / Funk” – playlist with timeless disco diamonds mixed with new edits and proper remixes, “Hip-Hop Sessions” or “Tech House Sessions” if some serious parties are involved later on. But sometimes you need to relax during day and “Afternoon Lounge” is the remedy in this case. Don’t be mislead with the word “lounge” – in this instance it’s more than a music genre, it’s our way of life. And we have great source of mixes for Party the night away. It’s our set of recorded live sessions. For last two years we’ve had the pleasure of hosting so many talented DJ’s so it’s really easy to find a suitable soundtrack for great party – just pick any of mix from “Live Sessions” and you not going to miss. You’re currently curating Baba Beach Clubs winter program and your weekly daytime ‘Casual Saturdays’ pool party is already in full swing. Given that your playlists are so carefully curated, how do you go about finding acts that are the best fit for Baba’s? Is it important to source both local and international talent? Yes, it is important to us that we have the balance between local and international talent. We are trying to play a role in growing the local scene and showcasing the amazing talent. Honestly though, we see everyone as artists and base most of our decision on the artists’ sound. Growing up in a family of well-known developers, you discovered a passion for hospitality and business at a young age. What led you to incorporate your passion for music into Baba Beach House? I think hospitality and music go hand in hand. For me my passions are food, travel and music and I believe they all fit so well together that it was only natural when creating Baba Beach Club that music was a big part of the experience. Will patrons get a chance to see you and hear you behind the decks? Sometimes, yes. I am usually there to enjoy the sets by our talented roster of visiting DJs, but sometimes I will play alongside some of our guest DJs. What are your top three go-to spots in Phuket for music lovers exploring the Island? There is so much to discover here, but personally I love island hopping. We are surrounded by some incredible islands such as Kho Ha & Kho Rok and the iconic Phang Nga Bay. Boats, clear water and good beats!